Dr. A.V. 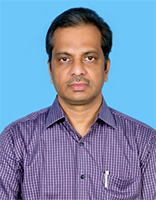 Sita Rama Raju is Professor of Mechanical Engineering at JNTUH College of Engineering Hyderabad, Kuktpally, Hyderabad. He obtained his Bachelor of Technology from V.R. Siddartha Engineering College, Nagarjuna University; M.Tech. (Thermal Engineering) from IIT Delhi and Ph.D. from IIT Madras. He joined JNTU in the year 2003 as Professor of Mechanical Engineering. He is having 30 years of overall experience in Teaching. 19 research scholars were awarded Ph.D. under his guidance as supervisor / co-supervisor and four more are in progress. He has published about 110 research papers in National / International Journals / Conferences. He has completed two sponsored projects from DRDO as Principal Investigator / Co-investigator and three consultancy projects. He has been member of BOS for Mechanical Engg. in various Institutes / Universities and also expert member in various committees appointed by University, AICTE and UGC. His area of research interests includes IC Engines and alternative fuels, Thermodynamics, Heat transfer, Refrigeration & Air conditioning and other thermal Engg. related subjects. Apart from teaching and research he has been assigned various administrative responsibilities viz. Head, Dept. of Mechanical Engineering, JNTUCEH; Training & Placement Officer, JNTUCEK; Vice-Principal, JNTUHCEJ; Professor Coordinator, Energy Systems, JNTUHCEH; Controller of Examinations, JNTUH; Vice-Principal, JNTUHCEH; Director, Admissions, JNTUH; presently OSD (Affiliations) to Vice-Chancellor.